His paintings sell for up to £4m, but a limited edition copy of Spanish artist Miquel Barceló’s latest work can be had for free – if you know how to peel posters off walls without tearing them. Barceló’s 1,500 posters appeared glued onto hoardings, pillars and walls in Barcelona this week after Spain‘s most commercially successful artist volunteered to design what is set to be the last-ever bullfight poster to decorate the city’s streets. 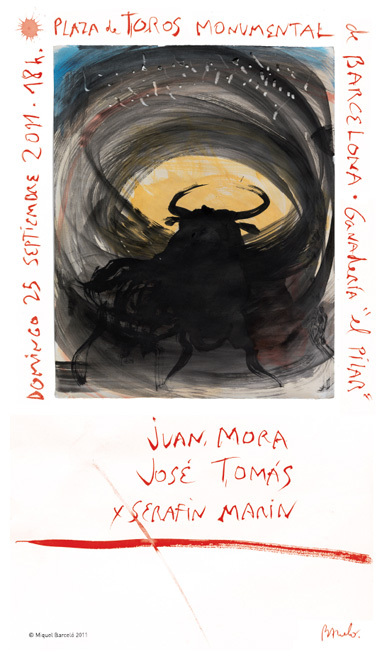 With bullfighting to be banned in Catalonia at the end of this year, Barceló asked to paint the poster for the Catalan capital’s last bullfight. Barceló’s most valuable paintings are bullfight scenes, with one fetching £4m at Christie’s in London this June. They continue a Spanish tradition that stretches back through Pablo Picasso to Francisco de Goya.